Whether pureed in a hot soup, or tossed in a cold salad, lima beans, also known as butter beans, add a richly textured complement to many dishes. Cooked and canned or dried and bagged, these large, creamy legumes are readily available in most supermarkets. Fresh limas are harder to come by, though you may have some luck if you check your grocery store vigilantly during the late summer and fall. 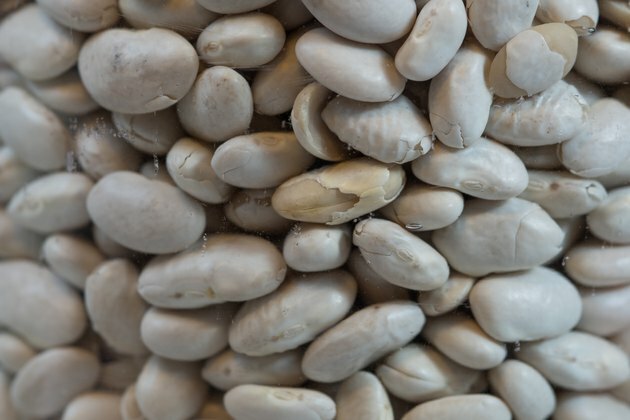 Like most beans, limas are packed with health-giving nutrients. Lima beans are mind-bogglingly high in molybdenum. A single cup of cooked lima beans provides almost 141 mcg of the mineral – almost twice the recommended daily value, according to the George Mateljan Foundation. This trace mineral doesn't get a lot of press, but it may be a great help to those who experience sulfite sensitivity. Sulfites are commonly found in wine, pickles, processed meats and dried fruit. A sensitivity to sulfites can result when a person does not have enough sulfite oxidase enzyme in his body. This enzyme is essential for detoxifying sulfites. Molybdenum is an essential component of this enzyme. When sulfites are not properly broken down in the body, a person may experience rapid heart rate, headache and confusion. Lima beans are full of belly-filling, colon-clearing fiber. The UC Davis Vegetable Research and Information Center reports that a half cup of boiled lima beans contains 6.8 grams of dietary fiber. That's about 33 percent of the recommended daily value for fiber. Dietary fiber is an aid to those with disorders such as diabetes and hypoglycemia, which are related to glucose metabolism. Fiber slows the spike in blood sugar that occurs after eating by absorbing stomach fluids and forming a metabolism-slowing gel. Fiber is also a crucial element in the ability of beans to lower cholesterol, and it helps to prevent irritable bowel syndrome and diverticulosis. Iron deficiency is one of the more commonly reported nutrient deficits in western society. Though iron is a plentiful on earth, those on certain strict diets, or who have increased daily iron needs due to blood loss, growth, gender or pregnancy may need to supplement their diets in order to consume an adequate supply. Lima beans can help such persons fight the nutritional good fight by packing 2.2 mcg of iron into every cup, according to the Centers for Disease Control and Prevention.